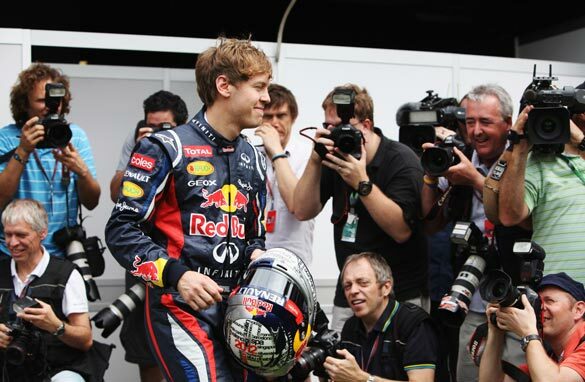 Sebastian Vettel is the center of media attention ahead of the opening grand prix of the season in Australia. The fact that there are six Formula One world champions on the grid for this weekend’s season-opening Australian Grand Prix, the most there has ever been, is amazing. As racing drivers, what they all want to do is win a race with the best possible grid. If they win against nobodies, it means nothing to them. But with six world champions, if they win a race, it is a huge accolade to have. One of the reasons it should be a really good season is all the teams seem much closer together this year. We won’t know the true nature of things until the end of the fly away races at the beginning of the season, but everything looks a bit closer. Even the midfield teams look closer to the front of the grid than normal. Ferrari might surprise a few people, because they still don’t have a very quick car. In Spain's double world champion Fernando Alonso they have got one of the best drivers on the grid, alongside Red Bull’s two-time title winner Sebastian Vettel and McLaren’s 2008 champion Lewis Hamilton. Alonso’s patience has got to be wearing thin, he has been very supportive of the company but he is a racing driver, he wants to be winning races. Mercedes could surprise people because they are much faster than last year and they will be a lot closer to the front of the grid than they were in 2010 and 2011. Seven-time world champion Michael Schumacher has struggled to reach his peak form since returning to the sport with Mercedes in 2010, but the sport has changed a lot. There are new technical regulations and different rules relating to tires. But the bottom line is Schumacher is not as good as he was. But this year, with the Mercedes being a lot quicker, he should be back up there. If there’s a sniff of rain or mixed conditions, Schumacher is always going to be the one who comes through and will probably grab victory. Like Schumacher two years ago, 2007 drivers’ champion Kimi Raikkonen is returning to the sport with Lotus, formerly Renault, after two years away. But unlike Schumacher, not too much has changed since the Finn has been away. His teammate, France’s Romain Grosjean, was not very good when he stood in for Nelson Piquet at Renault in 2010. Grosjean has gone away, he has matured and he has got a lot better. But he is not world champion material. I think he will flatter Raikkonen nicely. But the man to beat will be Vettel. The German is such a complete driver, every part of him is brilliant. People question his overtaking ability, but we saw at Monza last year, when he went round Alonso with two wheels on the grass, that he doesn’t have too many worries in that department. Vettel is the complete package and still so young -– he is going to stay at this level for many years to come. He is not the overwhelming favorite, but if the Red Bull is quick enough he will win races, which could make life tough for his Australian teammate Mark Webber. The 35-year-old didn’t have a great season in 2011, despite his season-ending win in Brazil. He was comprehensively blown away by Vettel. When a driver starts winning races, as Vettel has, the team starts getting behind you. As the other driver, you are going to start feeling left out. The McLaren pair of Button and Hamilton will be Vettel’s main challengers. Button and Hamilton get on really well, as well as you can as teammates. If someone beats you from another team, you just say their car is faster, but there is always that edge with teammates. They’ve got the same equipment and that is the perfect person to compare yourself to. McLaren are good at putting two very quick drivers into their team and letting them go for it. Obviously there have been bumps, with Alonso and Hamilton in 2007 and Alain Prost and Ayrton Senna in the 1980s. It doesn’t always go according to plan. But of all the teammates on the grid, you get an impression Button and Hamilton do get on very well. Button is actually a very normal, down-to-earth, decent guy, so it’s hard not to like him. He is at the peak of his career. He’s got the experience, he’s quick and he has obviously settled in really well at McLaren. He is one of the quickest drivers on the grid now and he’s got a very bright future at McLaren having signed a multi-year contract last season. What we will see this year is, if a team makes a single mistake, in terms of tire strategy or pit stops, they are going to pay for it hugely and finish 13th rather than sixth. Last year if you made a tiny mistake, you could perhaps hide it because the gaps between the teams were so big. But this year the gap won’t be there. That’s going to mean the team which makes the least mistakes is going to be right up there.